We explored the idea of conditional offers during camera handoff negotiations. Each camera controller employs a short-term memory model for maintaining a camera's own state and the state of its neighbouring cameras. The fact that each camera is aware of its surrounding cameras is exploited to generate conditional offers during handoff negotiations. This can lead to successful handoffs in situations where a camera is at its resource limit. We have developed behavior based-controllers for passive and active cameras, enabling these cameras to carry out multiple observation tasks simultaneously. Cameras intelligently respond to scene complexity by automatically capturing higher resolution video when there are fewer people in a scene and capturing lower resolution video as the number of pedestrians present increases. 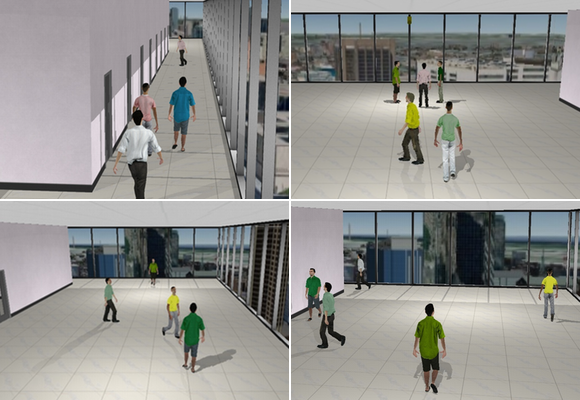 We developed a distributed, customizable virtual vision simulator capable of simulating pedestrian traffic in a variety of 3D environments. Virtual cameras deployed in this synthetic environment generate synthetic imagery boasting realistic lighting effects, shadows, etc. 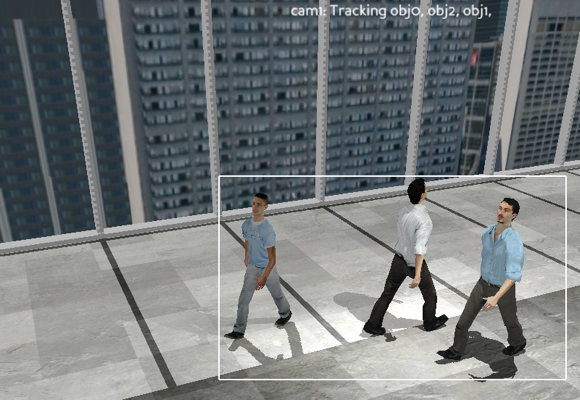 Standard pedestrian tracking techniques can then be used to track the virtual pedestrians making it possible to carry out camera networks research inside the simulator.